The twilight zone is that depth zone in the ocean between 100 and 1000m depth where a tremendous amount of activity takes place. Much of the material containing carbon which sinks out of the upper sunlit or “Euphotic” zone is broken down in the twilight zone and then mixes back up to the surface in the winter. If it manages to sink further, this carbon is lost for periods of centuries. 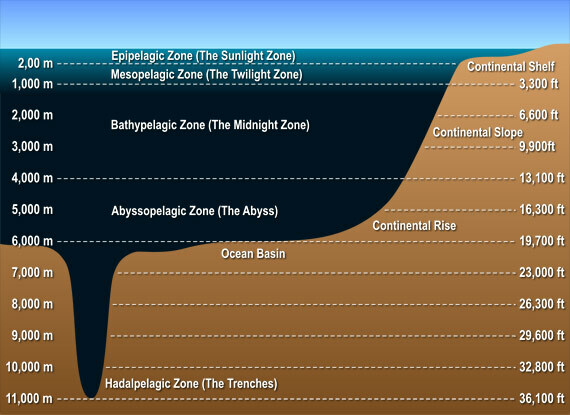 The main factor that affects this sedimentation process and the rate of destruction of the sinking particles is the structure and function of the biological community living near the sea surface and in the twilight zone beneath. This is because the planktonic plants and animals living there both generate and destroy particles. The Porcupine Abyssal Plain sustained observatory (PAP) is a heavily instrumented area of the open ocean 350 miles southwest of Ireland and in a water depth of 4800m. The instruments measure a wide variety of properties of the environment above the water, within it and on the seabed and much of the data is transmitted in real time to land via satellite. Although most of these data concern the biology and chemistry of the water column and seabed, for this particular year there is also a major physical oceanography programme at the site. This programme called OSMOSIS aims to examine the processes of mixing in the upper Ocean and employs an array of moorings and two permanent gliders which cruise around them undulating over the top 1000m. This cruise involves 19 research scientists from 7 European nations bringing together a very wide range of expertise including chemists, biologists, physicists and biogeochemical modellers. Many of these individuals are involved with the EU programme EuroBASIN. EuroBASIN is part of the trans-Atlantic BASIN initiative. This involves scientists from US, Canada and EU who are investigating how climatic and human activity affect the North Atlantic ecosystem. During the cruise we will use a wide variety of approaches to characterise the biological communities in the Euphotic and Twilight zones using water bottles, nets and video systems. We will characterise the chemical and physical environment and will examine the sinking particles and the rate of downward flux of material using water samples and the free drifting sediment trap PELAGRA. See where the James Cook is now.